Elaine Sernovitz Zimbel was born in Milwaukee on December 30, 1929, and lived there until she was 17 when she went to the University of Wisconsin at Madison. She studied comparative literature, philosophy, and French, and worked part time editing the news at radio station WHA, “the oldest station in the nation”. Even before she graduated with a B.A. degree and went to France on a Fulbright scholarship and a French Government Assistantship, she was a published author with articles in the University daily and in the Wisconsin Jewish Chronicle. In Paris she studied at the Sorbonne and taught conversational English in a girls’ lycée in Sceaux, near Paris, all the while writing short stories. Her first published story appeared in a new, short-lived magazine called The Paris News Post, and her second, written in Paris, would be published a few years after her return to the States in a magazine with a considerably longer shelf life. John Crowe Ransom was the editor of The Kenyon Review at that time, and he published her story, “Margie, This is Your Father” which had been championed by Saul Bellow at the Breadloaf Writers’ Conference in 1954. By that time Elaine had returned from Paris and settled in New York City where she fulfilled a promise she had made to herself during that dream-year in France, that she would avoid at all costs taking a nine-to-five job. She worked from eleven-to-eight in “Program Typing” at CBS radio, theoretically leaving her mornings free to continue her writing. The challenge of typing soap opera scripts and coffee commercials soon paled, however, and she was happy to accept a job with the United Nations working in the procurement department of the Korean Reconstruction Agency. The Agency had the job of aiding South Korea, the mainly rural part of the recently separated country, expand its economy to include some industry. From nine-to-five Elaine assisted in the purchase of items such as mining locomotives and sewing machines and the nuts and bolts to keep them going, while making every effort to continue writing whenever time permitted. In 1955 she married George Zimbel, a struggling freelance photojournalist. UNKRA was concluding its mission and George encouraged Elaine to collect her modest pension and join him in his cold-water flat on Second Avenue in New York City where she could “write”. A year later they rented a small part of a large house on the Hudson River in Dobbs Ferry, N.Y where they were living when, in the Autumn of 1956, “Margie, This Is Your Father” appeared in print in The Kenyon Review just days before Matthew Joseph, their first child, appeared in the flesh at the North Tarrytown Hospital. While Elaine continued to write and submit short stories, she found that being a mother was, for her, the greater imperative. 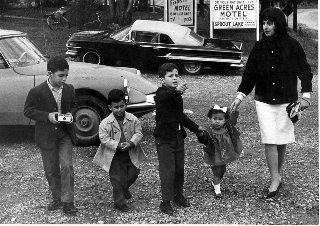 In 1958 and 1961 she gave birth to her second and third sons, Andrew and Ike, and in 1964, Jodi, their infant daughter, came from Korea to join the family. While fiction largely languished, she wrote and published articles for the New York Times Sunday Travel section, The Saturday Review of Literature, Pageant, Coronet, Parents, Baby Talk, and other notable journals. She also began training in psychodrama with its founder, Dr. Jacob L. Moreno and his wife Zerka, and in bioenergetic analysis with its founders, Drs. Alexander Lowen and John Pierrakos, and her articles on these subjects were published in prestigious professional journals in the United States and Britain. She worked as a substitute teacher in her children’s school district and following her training in psychotherapy directed psychodrama groups at the Moreno Institute in New York City and in Beacon, N.Y., and gave a psychodrama course at the State University of New York at Purchase. 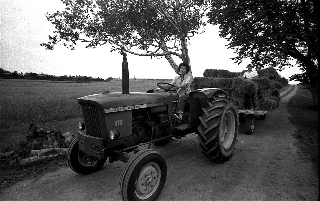 In the summer of 1970, she and George, with the concurrence of their children, bought a farm in Prince Edward Island, Canada, and in 1971 they emigrated from the States to P.E.I. where they all became “farmers”. Matt raised pigs, Andy and Ike were great with the cattle, and Jodi collected the eggs from the hen house. All of them drove the tractor, lifted hay bales, got an education of sorts, and thrived on the mostly home-produced food. George milked the cow and did almost everything else a farmer has to do in real life, taking time out to photograph significant people and events, while Elaine made butter, cottage cheese, and yogurt, tended the garden, preserved its bounty, sometimes wrote articles, founded the P.E.I. Psychodrama and Growth Centre and served as its executive director running a program funded by the Non-Medical Use of Drugs Directorate of the National Department of Health. She also had a small private psychotherapy practice, did freelance radio and television work with the CBC in Charlottetown, and in 1979 received a Gordon L. Bennet Award for Investigative Journalism for her series on The Medical Business in Prince Edward Island. In late 1980, she and George, their children having dispersed into other parts of Canada, also left P.E.I. to start an urban life in Montreal. Elaine offered psychodrama groups to professionals, began a private practice, continued publishing articles and wrote book reviews for The Globe and Mail. She did some radio work with Matt for the CBC and in 1999 – 2000 wrote and performed her own radio series, “Family Matters – thinly disguised” also for CBC. In 2002 she published the short story, “A Tall, Thin Lady”, in a special fiction issue of The Canadian Journal of Psychoanalysis” and in 2006, she wrote a special dedication for the International AIDS Vigil in Toronto which was televised world-wide. In 1999 Elaine joined the McGill Institute for Learning in Retirement, first as a participant and lecturer and then as a study group moderator selecting philosophy and literature as her areas of interest, mostly emphasizing her dedicated theme, “how literature informs psychology”. Elaine began work on a literary memoir in the late 90’s. While early chapters were encouraged by New York’s finest literary publishers, somehow the “offer” of publication never followed, so in 2005, she self-published “Bullet to the Heart, One to the Brain – a Psychodrama Played on the Page” with iUniverse. The book has touched the hearts of many people throughout the world thanks partly to its “compelling story of family fights told with heartbreak and humour” and also to its online presence provided by iUniverse. Elaine and George Zimbel continue to live in Montreal, continue to do what they have always done creatively, continue to enjoy their near and far children and their partners, their children’s children, and, miraculously, they continue to enjoy each other.